If you are considering making an investment in a landscape specimen, pondering the rejuvenation of a shrub border, or designing your own home landscape, I recommend that you first invest in this elegant and splendid book. 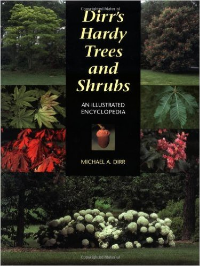 Dirr’s Hardy Trees and Shrubs an Illustrated Encyclopedia is a fabulous compilation of over 300 species of trees and shrubs, along with nearly 700 additional cultivars and varieties hardy to Zones 3 through 6 and possibly into Zones 6 and 7. Each entry is beautifully illustrated with examples of seasonal foliage, structural habit, and flowers. Every photograph was taken by the author attesting not only to his photographic ability, but also to the breadth of his travels and his intimate knowledge of each species and cultivar. He provides the reader with specific cultural information for each entry as well as its habit, flower color, fruit, bark, Fall color, and his personal candid comments on the attributes of each entry. In addition to the encyclopedic entries, Dirr includes in Part II of the book a guide for selecting plants for specific purposes or design characteristics. He has compiled lists of plants that you might choose for a specific color or fragrance or fruit set. There is a list for selecting specimens for Fall color or interesting bark color or texture. Trees are categorized by habit, i.e. weeping, or fastigiate. If you are considering a specific cultural environment, he identifies trees and shrubs that most likely will do well in moist or wet soils, thrive in compacted soil, heat, drought, shade, or have a high salt tolerance. Flowering sequence is also described. If you have a small or large landscape, he has you covered with trees listed by size. He even has a list of underutilized species and cultivars. And the list goes on with more information on pruning times, ground covers, and shrubs amenable to hedging or massing. Professor Dirr makes the disclaimer that “personal bias” plays a role in his selections, but I found that inclusion resulted in a less formal and very readable book. This could qualify as a coffee table book, but I think that you will find yourself referring to its vast amount of useful content so often that it will be close at hand. Dr. Michael A. Dirr is a very highly respected award winning professor of horticulture at the University of Georgia. His many other horticultural endeavors include plant breeder, author, and lecturer. He recently graced our area as guest speaker at the Berkshire Botanical Garden’s winter lecture series. He is also known for his research on remontant, or reblooming, Hydrangeas and the introduction of The Endless Summer series in conjunction with Bailey Nurseries.